We’re helping Meantime move from a cult favourite to a brand that everyone recognises – famed through the land for their craft approach to beer making. However, along the way we also want to make sure that everyone knows just what goes into making a pint of Meantime taste as good as it does. So we need to take our drinkers with us on the journey – while we want to sell more, we don’t want to be seen as having sold out. So it was that we got chatting with the lads at ShortList Magazine (Britain’s biggest men’s mag no less) and thought that cooking up a brew with them to celebrate the launch of their inaugural “Gastropub of the Year Awards” might be a smart move. 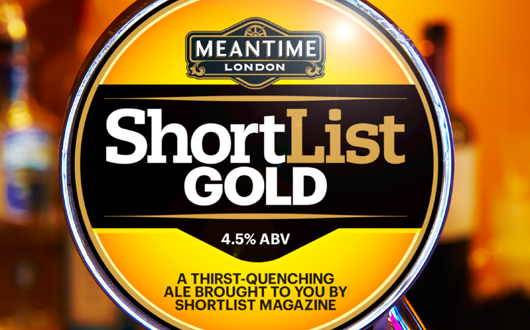 Following an intensive education for their editorial team in the art of modern craft beer making and an – ahem – extensive tasting session, we got down to making ShortList Gold, designed under the watchful eye of The Old Brewery’s head brewer and beer sommelier, Rod Jones. A month or so later and the beer has hit the street. Available in a handful of quality boozers across London, ShortList Gold has proved a sell-out success. And the coverage on the making has been a text book piece in getting across a client’s key messages and delivering cracking awareness of just what it takes to make a pint of Meantime.